In the previous article in the series on this project, I mentioned I had a spare GT 620. The card specifically is the Zotac GT 620 2GB. Unfortunately I couldn’t get it into the currently running system, but in making some considerations for additional hardware, I did come up with something else. One product I’d seen on the shelves at Micro Center is the ASRock BTC Pro. For those unfamiliar with what it is, it’s a PCI-Express extension system — a PCI-E x1 “card” goes into the PCI-E slot on the mainboard, while a PCI-E x16 receiver goes onto the card. It has a custom 5-pin power cable to transfer power between the mainboard and graphics card, and it uses 2 standard SATA cables for data. Pretty nifty little thing. 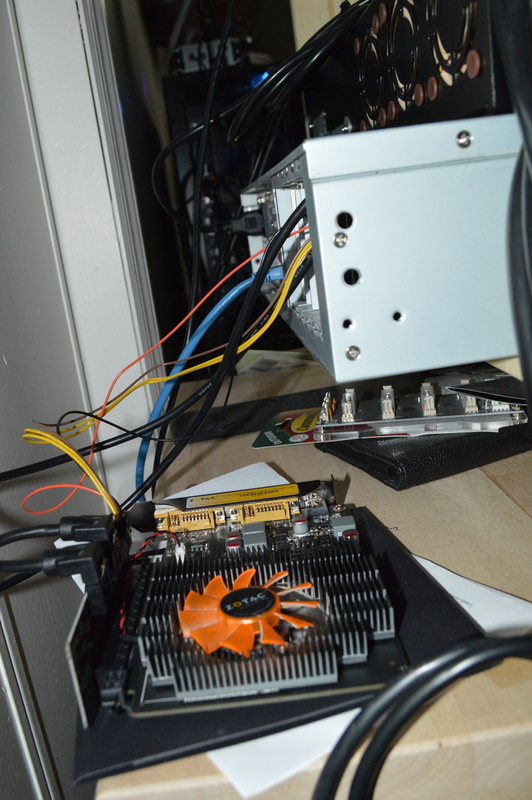 And I used it to plug the GT 620 into the X2 mainboard to see how well it would work. And it’s working fairly well. Milkyway@Home is reporting the card functioning at about 18 GFLOPS, about 9x the performance of one of the X2’s cores, but — unsurprisingly — about 28% of the performance of one of the GTX 770s in Beta Orionis. As the pictures above demonstrate, the card is just sitting out in the open currently — this is just a proof of concept more than anything else at the moment. And the temperature reported by the card is just under 50C (fresh thermal compound might do better), so it’s staying well around a decent temperature. The interesting thing is that since part of one CPU core is dedicated to talking with the GT 620, only one core is being used for processing, keeping the temperature inside the case significantly cooler: the cores are sitting under 40C and the chassis is reporting an internal temperature of 37C. The custom power cable and use of SATA cables doesn’t really impress me, though, so, again, consider this setup just a proof of concept. Searching online I did find similar setups that use a USB 3.0 cable instead — male A to male A. This got some gears turning in my head as to how I could create a setup. USB 3.0 cables can be longer than SATA cables, plus the USB options have a standard 4-pin Molex or 4-pin floppy power connector, meaning they can be powered directly from the power supply. Again, seeing these got the gears in my head turning, and I’ve got some more experimenting to do as a result. This also provides interesting implications for what to do with regard to future upgrades. But first, I’ll want to test one of the GTX 660s to see what kind of performance it can provide. 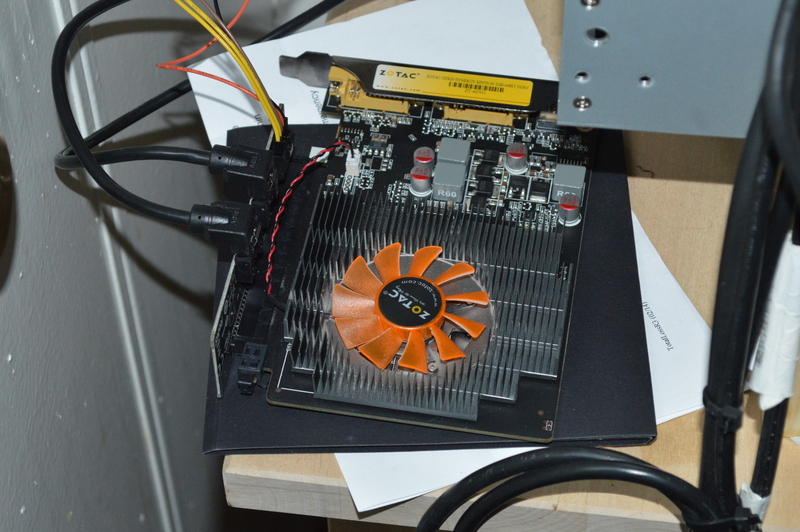 I just need to pull the water block off one of the cards to put the stock cooler back on.